Thought I'd best make a start on my entry. I had a bunch of different ideas floating around (as usual), but they were more tidbits of different things; nothing particular. Anything from exploring the four elements, referencing mythological creatures and exploring dark or death-related things like shadows and ghostly figures. 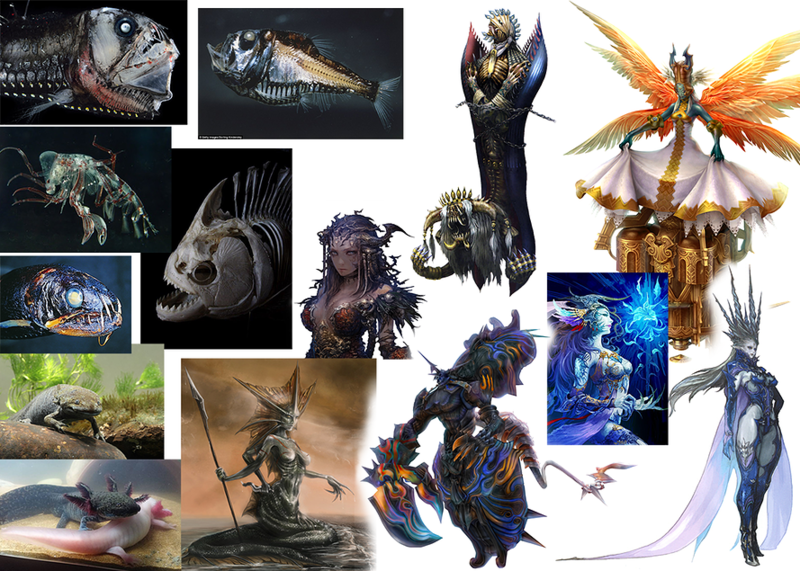 This led me to look into the many-varied Final Fantasy summons and design focusing around an element or particular type of creature; in this case water. I had originally thought to do something quirky or more comedic e.g. a bumbling not so evil character that's trying too hard. I later decided no to go that route, but also didn't want to create something too cliche. 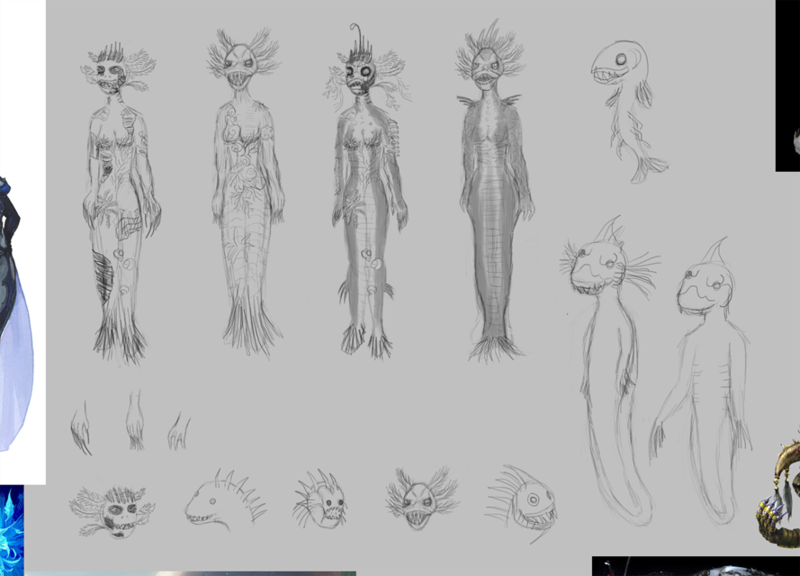 I'll move onto some concepts next, though I won't be spending too much time on these as I'm not much of a concept artist and I tend to work things out as I sculpt / model. 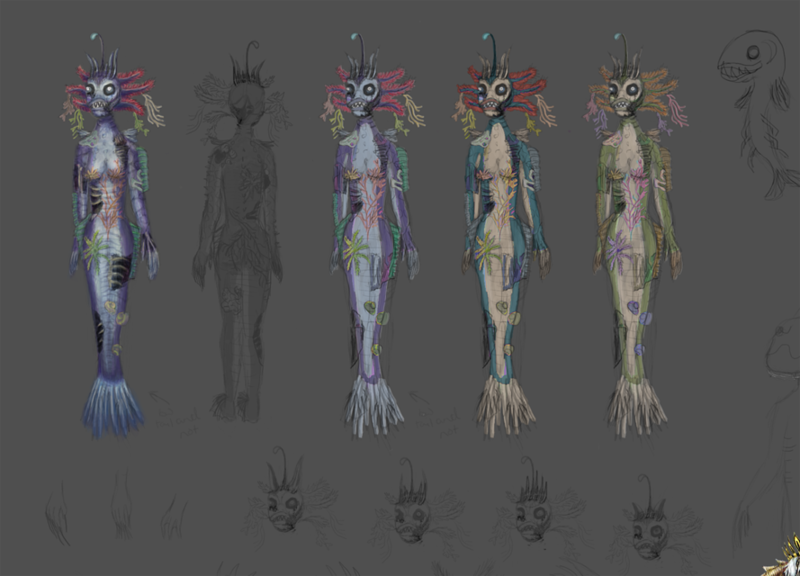 Here's a bit of an update on my design process. Just roughly sketched out and tried to work through some of my ideas and refine them a bit. I think I like the third one for the most part and will probably play around some more with the amount of deacy, 'clothing' and placement and proportion as I go. 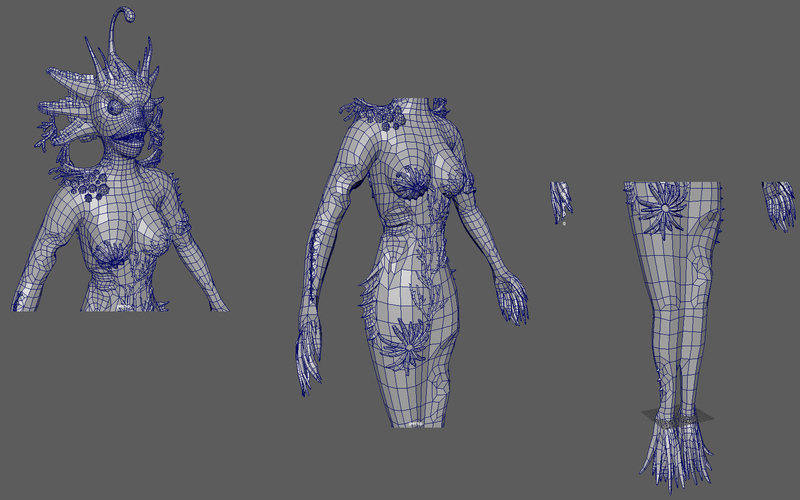 I won't worry about awesome poses for now as I can revisit this if needed or figure it out once the model is rigged. Happy to hear any thoughts or suggestions. Worked out a couple more things, colour and a bit of the texture work and I think I'm going to leave the concpeting at this stage for now. Onto the sculpt! 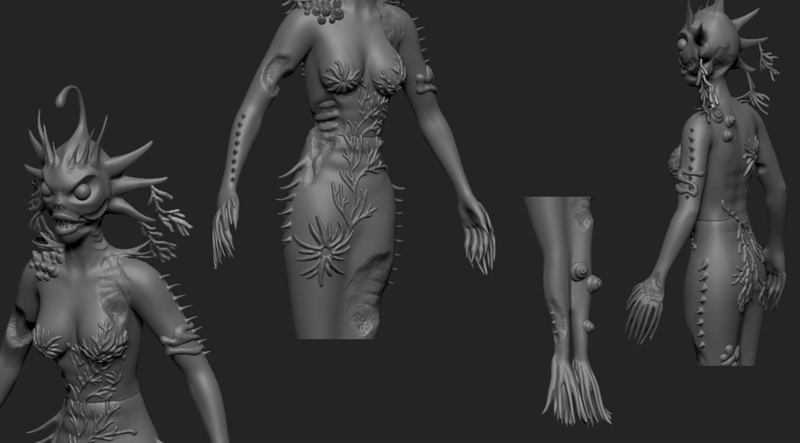 I've been chipping away at the sculpt and here's what I have so far. 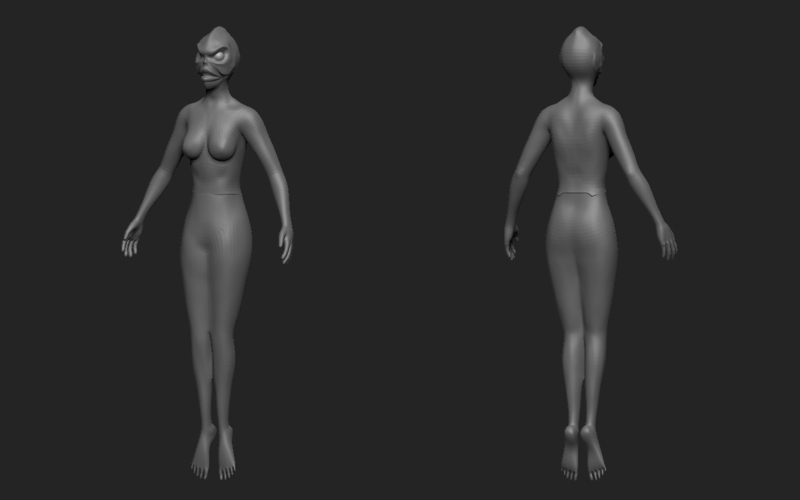 I think I have the proportions worked out for the most part and a fairly good base for the character. Next I'll be finalising the forms some more and making a start on the detail work. Thanks for stopping by and feel free to share any tips or ideas. Character update! 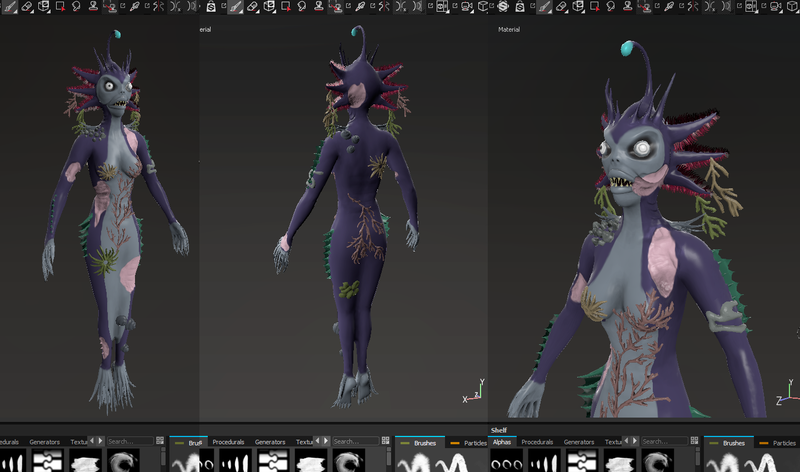 I've made a few more adjustments and finalised the base forms for the most part and have now added all the spiky / spiny bits for the 'crown', 'hair', teeth and fins. I'm not entirely sure how I'll do the frilly red bits on the 'hair', but I'll probably leave that until later and use hair cards for it. I've spent some time creating a custom VDM brush (I'm using ZBrush 4R8 by the way), partly because I've never created a custom brush, I wanted to use a new feature and because I chose to work with subdivisions. I figured it would be perfect for all the spikes, fins and fangs in my design and it is quite good and saves time to an extent. Playing around with it was heaps of fun too. The issue I had was that I couldn't use any modifiers to bend or tilt the brush, as they were greyed out. I had to make some manual adjustments instead with masking and polygroups, the good 'ol fashioned way and had to wonder how much time (if any) I actually saved in the longrun. Anyway, that's my rant. 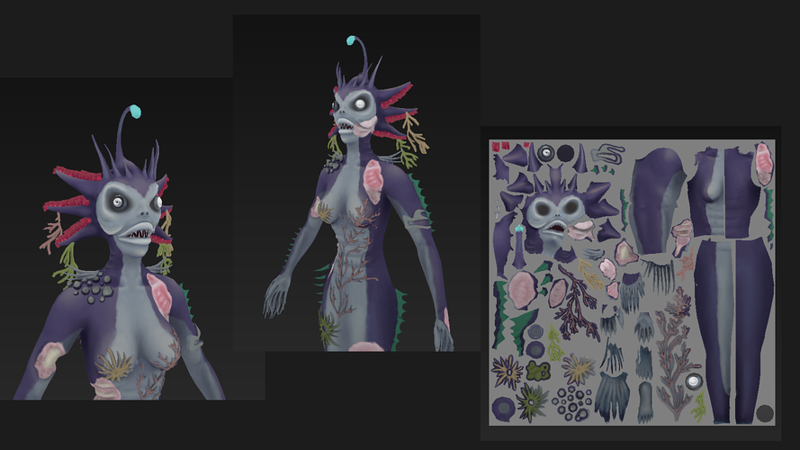 I'm going to detail and polish up in and around aaaaall the spiky bits and start forming the 'clothing' and other objects picked up from the ocean floor. I'll need to wrap the sculpt up real soon or I might not be able to finish my character in time (eek!). A couple more detailed shots. I'll be wrapping up the sculpt soon (though ideally I would have done this already). I did another detail pass and added all the sea muck she picked up along the way. I considered leaving some details out of the sculpt, however, much like during the concept phase, as I played around with adding and removing certain elements, I thought it still looked best with everything 'intact'. I still want to add the deaced / 'chewed off' areas like in the concept. Again I considered leaving this out, but I feel it balances out the overall design a lot more and makes it more intereseting. Another entry for today (I must be working real hard). The mistress now has all the gnarly decayed, chewed off, chopped up bits throughout. I didn't make the extra detail too defined as I was not only short on time, but not exactly sure how I was going to go about it. I left it somewhere in between and focused more on the forms. 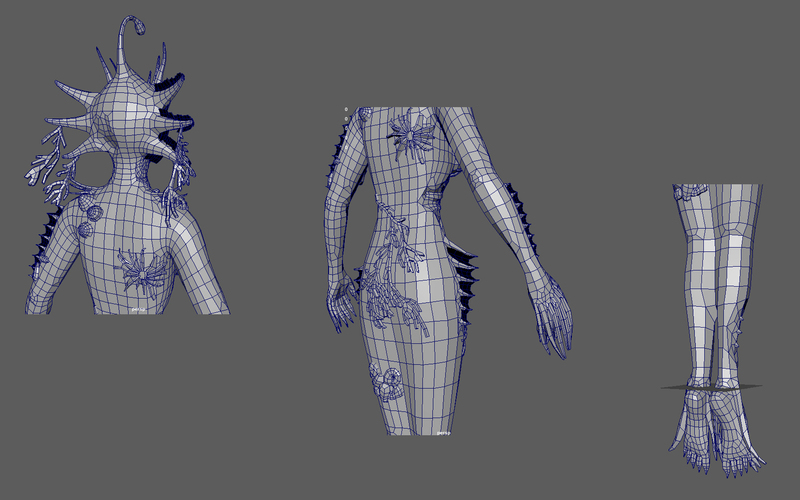 I can define it more or make it more gross looking when I texture it. I was going to add some surface detail to the sculpt, but I decided that I'd show it in the texture instead. I am fairly sure that sculpting it in won't make too much difference, though I can always add it later if I change my mind. She now has 2 eyes. I had considered having just the one or a gross dangling, decaying eyeball, but what I'll do instead is make both a bit different in size and / or colour. It's been a heck of a week and I almost 'threw in the towel', but I'll stick it out and see how complete a piece I can come up with in a short amount of time. The retop has taken a lot longer that expected, but it will help make the next few steps in the process a little easier. There have of course been a few setbacks along the way. I forgot that when exporting tools from ZBrush, any polygroups you have created will be broken up into separate meshes. One thing I liked about this (that I don’t think I knew before) was that hidden polygroups were removed from the mesh on export as I had some overlapping objects that this came in handy for. 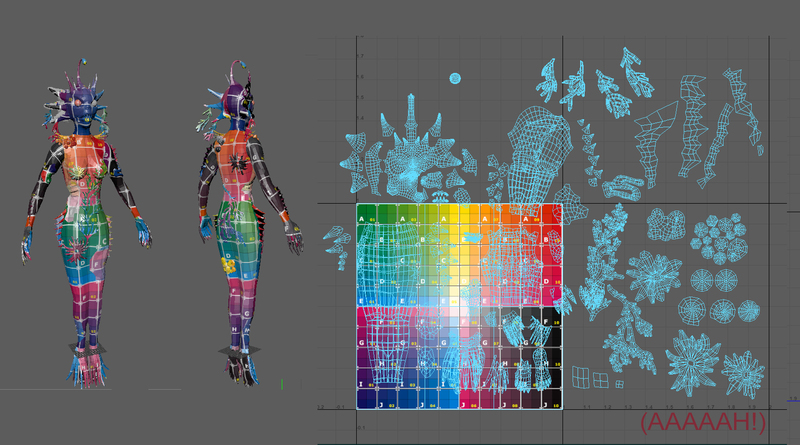 Attempting to sort through and combine the meshes in Maya was not the best idea, so instead I had to re-export most of the meshes and make sure there were polygroups where I specifically wanted the mesh separated and not. Some time wasted, but at least I’ll be sure not to forget next time. Speaking of time wasted, I uncovered a fun issue in Maya. After exporting everything from ZBrush (more than once :/), I imported all the .obj’s into a Maya scene and converted them to alembic (.abc) format as this reduces/prevents any lag you might experience when working with large files. This does almost double the file size, though did I consider that working with a large file might be a problem (despite having a fancy new system). Turns out I was right. Maya 2018 hates binary files (.mb) over 2GB. The workaround I found was to save it out from a previous version as a .ma file, though this will drastically slow things down. This didn't work in my case unfortunately and I did lose some of the retop work I had done on the face. It wasn't a Maya 2018 specific issue, as I tried to both fix and replicate the error in a few previous versions of Maya. A few things to avoid this in future would be to save the file out in more than one format and I could have exported what I already retopologised separately as a bit of a safeguard also. Now I'm moving onto what will hopefully be a quick unwrap of my model. Still chipping away at this even though I'm pretty sure I won't have anything complete enough in time to submit. UV's are nearly done, just need to move a few things around to fit the space properly and scale. Let's see what I can get done texture-wise before the deadline. Welp, goes without saying that I wasn't able to finish my character in time. Although I figured I'll continue this thread as I finish things up regardless. I don't usually document my progress, but found that I actually don't mind and if one of you reading this can take something away from it also, that makes it even better. I've just started learning how to use Substance Painter and so far so good. 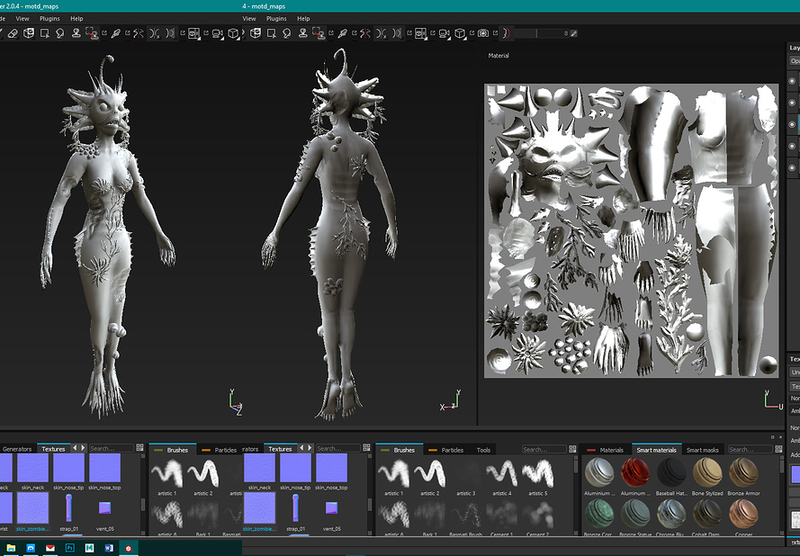 I baked out the normals and ao of all the bits and pieces for my character, popped them into Substance, did some touch-ups in Photoshop and tried to figure some stuff out on my own, but I had no idea what I was doing. I eventually found that you can paint straight over normal and ambient occlusion maps in both 2D and 3D views. I cleaned those up further and here's what I have. I think I'm getting the hang of things now. It's a bit of a different headspace as far as how the software works vs. other programs I've used. The default shaders are kind of odd, but again, I'm getting the hang of getting things to work and display as I want. Base colours are down, the ao and normal maps are playing along fairly nicely (after some adjustments) and I've started making some adjustments to my base. Now I can get onto some detail work. I have an idea of what I want, but I'll still play around with a coulple of things and work it out / flesh it out more as I go. Still 'chipping away' at this for those of you who are following along (and any newcomers of course). I decided to hand paint the forms in and some detail, though I don't know how exactly I'm going to finish it off just yet. It felt really foreign at first because I haven't painted anything in a while (been mostly sculpting lately) and it took me a while to 'find my feet'. Once I did though, it all came back to me and I remembered how much I love it. Here is how it's looking so far with colour, ao and gradient maps only and flat lighting. Almost done hand-painting and might add some suface detail and play around with some Substance goodies. Not the best example of an ideal or efficient unwrap (I was rushing at the time), but it'll do. Hoping to finish this up soon so stay tuned and feel free to leave any comments or suggestions. Alllllllllright, I'm calling this done. Might tweak a few more things presentation-wise, but this is pretty much the end result.